The history of the genus Pochonia (Clavicipitaceae, Hypocreales) is charted from the pre- to post-molecular era. The relatively recent use of more sophisticated molecular techniques – as exemplified by multigene phylogenetics – has enabled the unravelling of this convoluted taxonomic tale and there is now light at the end of the tunnel, especially with the realisation of the ‘One fungus, One name’ (1F, 1 N) initiative. The present status of the genus – and its near relatives on nematode hosts – is discussed. Currently, only one species, Pochonia chlamydosporia, is recognised within the genus, with five varieties being delimited, two of which – var. chlamydosporia and var. catenulata – produce sexual morphs on alternate hosts: molluscs (snail eggs) and insects (beetle larvae), respectively. Species originally assigned to Pochonia are now accommodated in the genus Metapochonia. Pochonia chlamydosporia is a multitrophic species, parasitic on, or pathogenic to, both invertebrate and nematode hosts, as well as being a plant symbiont. 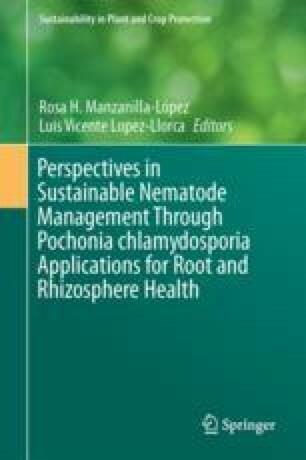 Finally, recommendations are made for future research: it is expected that the varieties of P. chlamydosporia will be elevated to species rank, whilst it is predicted that many more species will be identified within the genus as intensive and more focused, selective sampling is undertaken, particularly of soils and plant roots in tropical forest ecosystems.